Wapakoneta’s Aaron Chambers looks for running room as Trotwood-Madison’s Jayvanare Nelloms closes in to make a tackle attempt during Friday night’s Division III, Region 12 playoff game at Wapakoneta’s Harmon Field. Wapakoneta’s Evan Kaeck fights for yardage as Trotwood-Madison’s Tyler Wilcox tries to bring him down during Friday night’s Division III, Region 12 playoff game at Wapakoneta’s Harmon Field. WAPAKONETA — For the second straight week, Wapakoneta’s Luke Beach delivers. The senior field goal kicker split the uprights with 4:56 left in the game that gave Wapakoneta a 24-21 lead and after a big defensive effort in the final four minutes, the score would hold up and not only give the Redskins the three-point win but vanquish a ghost from postseason past Friday night. The win ends a four-game postseason losing streak over the Rams who have eliminated Wapakoneta in the playoffs in 2011, 2014, 2015 and 2016. Moyer added that it was good to finally beat Trotwood-Madison. “Obviously its been a door that we have been knocking on door several years with Madison and we broke that door down tonight,” Moyer said. 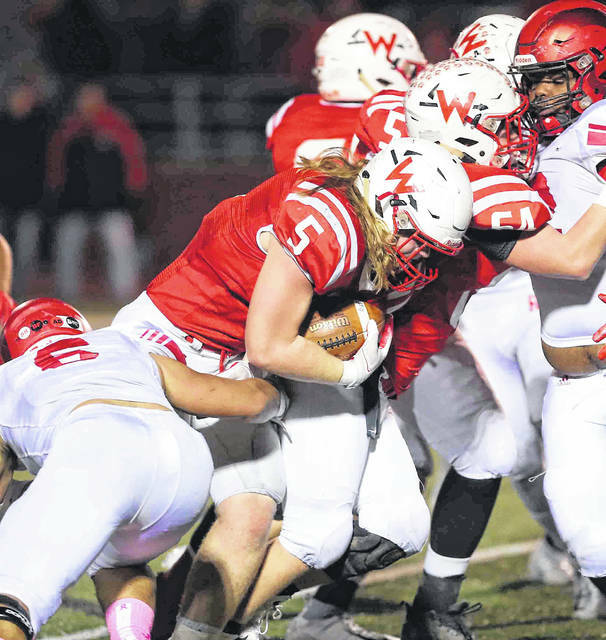 Despite being outgained throughout the game, Wapakoneta’s opportunistic defense proved to be a major factor in beating the Rams. Three times the Redskins forced a fumble and three times the Wapakoneta offense would reward its teammates with points. The first two turnovers helped Wapakoneta overcome a 14-0 deficit in the first quarter. Trotwood-Madison appeared to have its magic spell over Wapakoneta again after breaking out to a two touchdown lead after the first quarter. However, the Redskins would rally to knot the score at 14 in the second quarter. The first touchdown came when Wapakoneta recovered a fumble on a botched fair catch to put the ‘Skins in prime field position at the 19. Six plays later Redskin signal caller Erb bulled his way in from 4 yards out and after a successful extra point, Wapakoneta was down 14-7 with 4:41 left in the first half. On the Rams’ ensuing possession, the Redskins forced a fumble on second down at the 35 and Wapakoneta was once again in excellent field position. Seven plays later, Redskin running back Evan Kaeck plunged in from 1-yard out. After making the extra point, Wapakoneta and Trotwood-Madison were tied at 14 with 43 seconds left in the half. Wapakoneta was feeling good about tying the score but that was quickly quelled when Trotwood-Madison scored on its second play from scrimmage from the 48 yard line when a pass intended for one Rams receiver was deflected into the awaiting hands of George Anderson who grabbed the gift and raced into the end zone to give the Rams a 21-14 lead after kicking the extra point. After a scoreless third with both teams playing tight defense, it was Wapakoneta that would tie the game on a 13-play, 87 yards drive that was capped by Kaeck crashing his way in from 1-yard out on a fourth and goal. The game was knotted after the successful PAT at 21 with 8:18 left. The third key turnover that would eventually lead to Beach’s game-winning kick came when the Rams fumbled on the first play from scrimmage on their next possession and Wapakoneta recovered with a little more than eight minutes left. 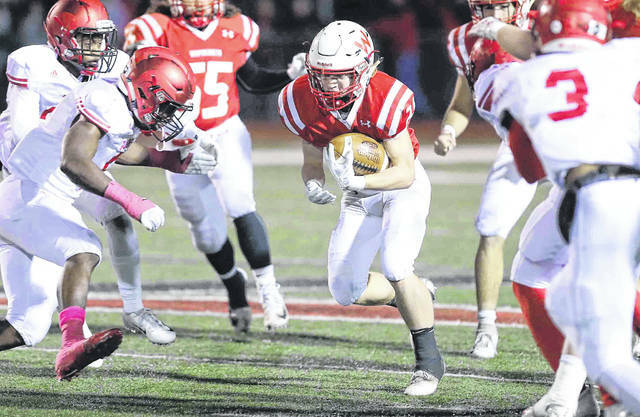 Six plays later Beach played hero for the second week in a row and while not as exciting as the last second boot to beat St. Marys, it did give Wapakoneta another win. The Rams’ Dae’Vontay Latimer has a monster day with 235 yards and two touchdowns on 22 carries. He had TD runs of 92 and 5 yards. For Wapakoneta, Erb finished with 77 yards and one touchdown and Kaeck ended the night with 65 yards and two touchdowns on 18 carries.